Born in 1975 in Berlin. She regularly moves abroad to live and work artistically. The influence of her stays abroad can be seen in her pictures. She regularly exhibits successfully in galleries and museum institutions. Works are privately owned and in public collections in Germany and abroad. Since 2002 she has received many national and international art prizes as well as art grants and scholarships. Her work is recognized and rewarded nationally and internationally. Balancing his wandering life in Latin America, Europe, America, and North Africa, Scottish travel writer, politician, and adventurer Cunninghame Graham (1852-1936) noted: "He writes ... of things that make a traveller, the journey is over, make the best of all travel feel again - their melancholy.” In the age of new media, clip aesthetics, speed and talk culture, melancholy, contemplation, silence and slowness appear as a world access to a bygone era. The term is used psychologically; the accusation of aimless reflection resonates mostly. My work is an activating reference to the repressed and lost consciousness of the diversity of our life world. Confronted with the tension between dream and reality, the mainspring of human action, the viewer becomes a partner in a dialogue that is open but not arbitrary and provides insights rather than an overview. My work is an expedition into the perception of our world. I have tried not to portray a utopia of a homeless dream, but an idea viable in the here and now. The urban, architectural and landscape space is the central theme of my artistic exploration. 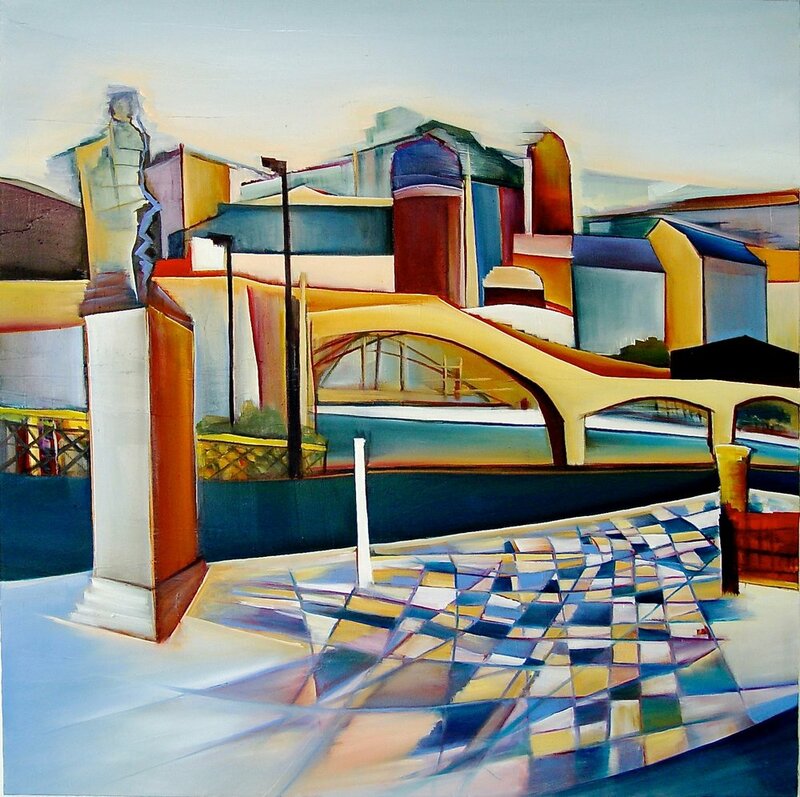 In my pictures, I transform space and landscape into an independent figurative entity. 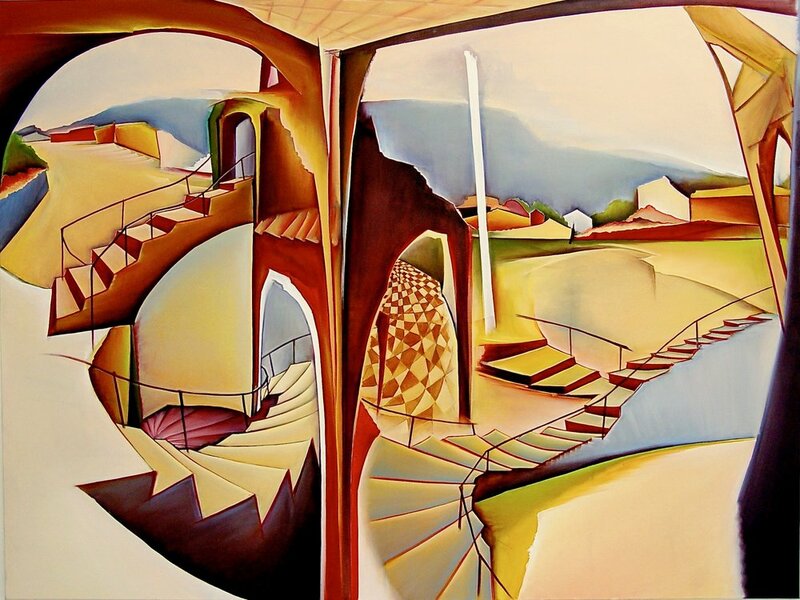 In my paintings, I create imaginary spaces in which neither perspective nor architectural constructs could exist in this way. I shift viewpoints, distort planes, deform bars or reduce distances. Nevertheless, my pictures are real, the rooms are theoretically accessible. My handling of light supports flatness or depth, reflects motifs or illuminates hidden corners. Light creates in my pictures exactly what could not be so in reality. A very striking element in my work is the lack of people. Dimensions and proportions thus remain unmeasurable. Although all that I paint might actually be a human construct, it lacks the protagonist. It is not the man who creates here, but the imagination. I push the viewer into a surreal world: where does materiality end, where does our imagination begin? The passion and joy for the painting and the colors I have since childhood. Through my grandmother and mother, I was introduced to art very early. I was always encouraged and supported by my family. Since my earliest childhood, I remember painting and drawing together and many visits to exhibitions and museums. Already as a child I wanted to be an artist, a painter. Basically I get the inspiration completely from me. Everything that I see and experience, everything that impresses me will be found later in my paintings. Often I live and work abroad. Especially I like being in the cold north, in Iceland. I love the clear light in the northern sky and the wild original nature and landscape there. But I always like to come back to Berlin. Long-distance and homesick always alternate. That is also very important for my work. Concentrated, I get in other places new impressions, experiences, ideas and inspirations, which I then build into my paintings. In the age of new media, clip aesthetics, speed and talk culture, I want to bring the viewer to reflections, silence and slowness. My paintings are an expedition into the perception of our world. This can often take a long time. But at some point I have the feeling that I am on the right path and that I will bring the painting to an end. Then, someday, then it's done and I hang it on another wall in my studio. And now I check in the next few weeks if it is really finished. Sometimes, after a few weeks, I can take the painting back to my "paint wall" and than I make things better, clearer and more concise. Actually every moment I spend in the studio is a little highlight for me. I just love painting and I like to be together with my colors. But also I experience highlights when I'm particularly impressed and fascinated in an exhibition. Or if I have painted a really great painting. But even if my work is valued, bought by collectors and when my artworks are exhibited, than I am always very excited. But a particularly nice personal moment was when my dad wrote me a very lovely letter when I was graduated. These words, which were full of pride, I never forget them. That is very, very different. It can take up to 4 months for a large format and complex painting. But about twice a year it can happen that I finish a small artwork within only 2-3 days. In 2020 I have a big exhibition at the Museum Eisenhüttenstadt in Germany, that's what I'm preparing for. I'm trying to create new works. But I also have some other exhibitions planned. Current information can also be found on my website. I do not know that. I let myself be surprised. I wish that my works will continue to be recognized and touch and fascinate the viewer. Above all, I wish me health, joy, lightness and passion for art and eternal creativity.